​. . . an international, interfaith community to educate, advocate and encourage prayer for the protection of vaccine choice; for informed consent; for victims and families who live with vaccine injury; and for those who have experienced the heartbreaking loss of a child or other loved one to vaccines; for safer, more ethical vaccines for those who choose to use them; and for the scientists, doctors and lawmakers responsible for vaccine development and policy. Read "A simple Idea with a BIG vision . . . "
Thank you for visiting this website. 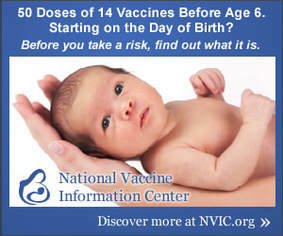 If you are new to vaccine safety research, and are not sure where to start, please click here. ​The documentary, Vaxxed: From Cover-Up to Catastrophe exposes fraud and corruption within the CDC in connection with a 2004 MMR/Autism study, that has led to the exponential rise in autism. Vaxxed has played in theaters throughout the U.S., Canada and Europe. Click here for viewing options. The DVD is available for purchase at www.vaxxedthemovie.com. or amazon.com. For information about the VAXXED Nation Tour, visit www.vaxxed.com. Vaxxed related blog posts can be found here. The Truth About Vaccines is 7-part documentary available for free viewing. Click here to watch trailer and to register for this very informative series. Vaccines Revealed is a powerful 9-part series currently available for free viewing. Click here to watch trailer and register for access to series. Click here to join our community or submit a request. ​and for families of those who did not survive their vaccine injury. "Again I say to you, if two of you agree on earth about anything for which they are to pray, it shall be granted to them by my heavenly Father. For where two or three are gathered together in my name, there am I in the midst of them."